A few favourites of my own photos for the challenge! 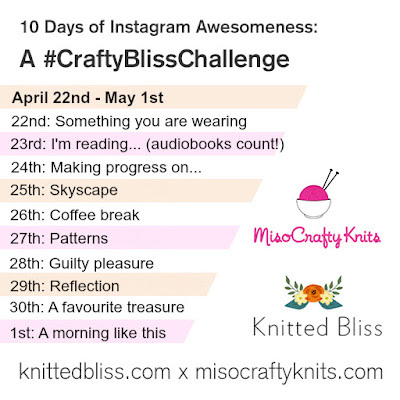 The Spring #CraftyBlissChallenge on Instagram ended just last weekend. First though, I would like to say a massive "thank you!!" to all of the people who participated in the challenge, whether you managed to complete all ten days or not. I had so much fun scrolling through all the photos and seeing everyone's interpretations of each prompt. Since Julie and I have done this challenge before we kind of had an idea of what to expect. We were pretty excited to discover that 83 people had finished the challenge from start to finish!! Wow!! There were a few who joined in on the fun late, and a few who admitted that they couldn't continue on because...well, life happens. And that's ok! I'll admit that I had to double check my days quite a few times too! I really hope that those who did the challenge and those who followed along have been inspired, have found news ways to look at things, and possibly found others that they like to follow on Instagram. I know I was definitely inspired, in awe, and at times felt very touched by what some of the participants had posted. A few even brought tears to my eyes as the stories behind the photos were just so moving! 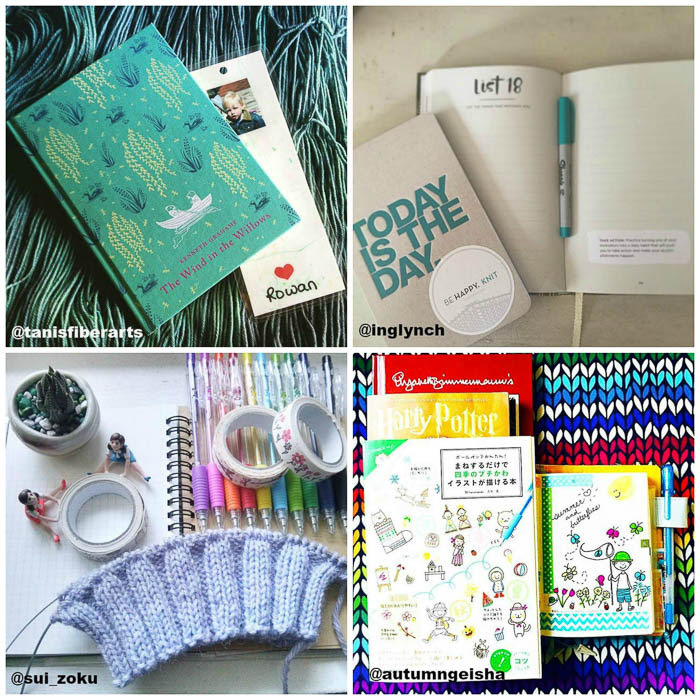 Anyhoo...I truly loved the fact that no one felt compelled to make every photo knitting or even craft related. 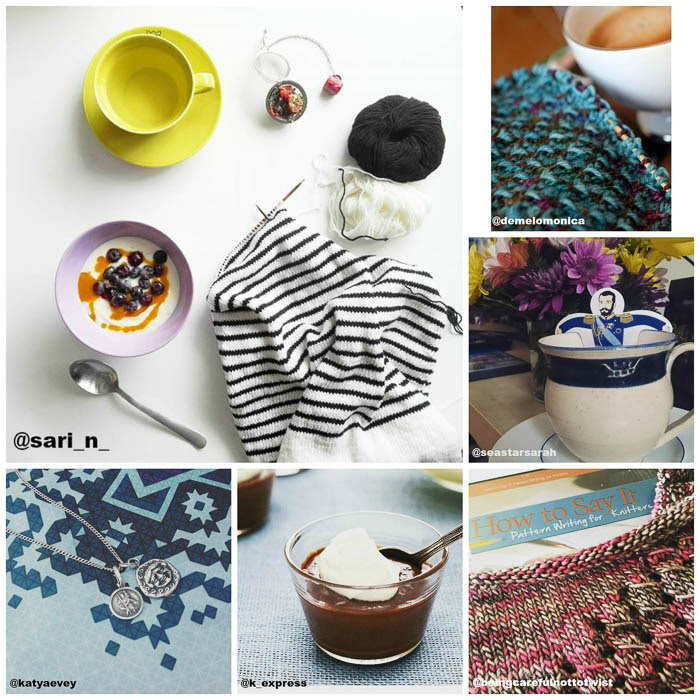 While there were quite a number of knitting related photos (with prompts like Making Progress On how could there not be?) I thoroughly enjoyed the ones that had nothing to do with knitting but still had so much creativity and/or meaning behind them. 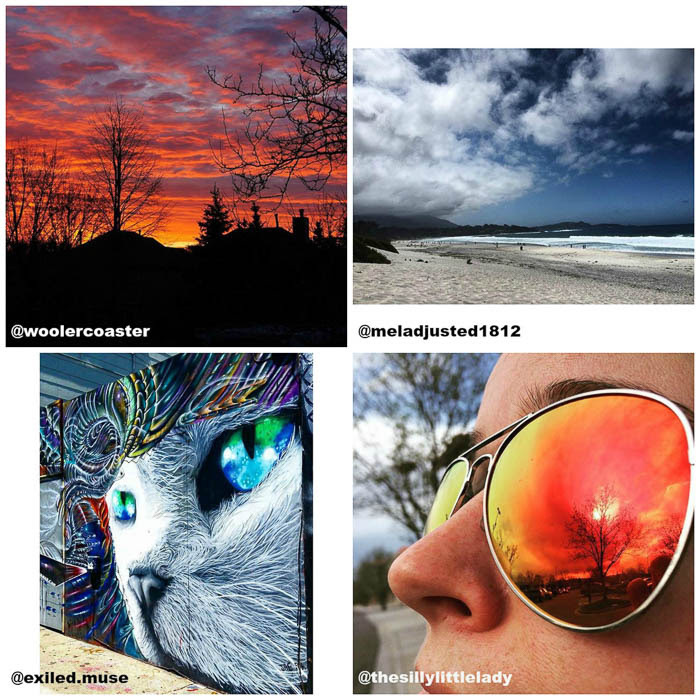 Or were just downright beautiful or cool, like the gorgeous sunset photo and the reflection of a sunset in the sunglasses (SO cool!!) in the first collage below. Out of all the prompts, I'm Reading, Skyscape, and Reflection were my favourites. I added a lot of titles to my "to-read" list, including the hilariously named The Life-Changing Magic of Not Giving a F*uck, a parody of Marie Kondo's best seller book that I'm pretty sure everyone has read, praised, recommended to others, and most likely tried to do in their own life (I know I have). So funny! I follow a lot of knitters, crafters, foodies, and nail polish lovers so I usually see what's being created or a lot of hands (like, a lot), so I found it really interesting to see where everyone was from in the Skyscape prompt. For some reason I figured everyone was from my area and a few scattered around Toronto, so I was surprised and utterly delighted to see images from San Francisco to Las Vegas to Paris to Scotland! Amazing!! I had no idea! Another reason why I love Instagram so much. The Reflection prompt brought on all the feels. I don't know how many people stopped to read the story and comments behind the photos, but it was touching to read so many heartfelt moments, thoughts, and raw honesty being shared. I usually see snapshots of knitting, crafts, food, and manicures in my IG feed and rarely see what people do outside of their crafting so to catch a small glimpse of someone's life outside all that was interesting and at times, I felt honoured that someone would let me see that. So thank you to those who shared those intimate moments! Now that the challenge is over I find myself still trying to think outside the box and be more creative with my photos. 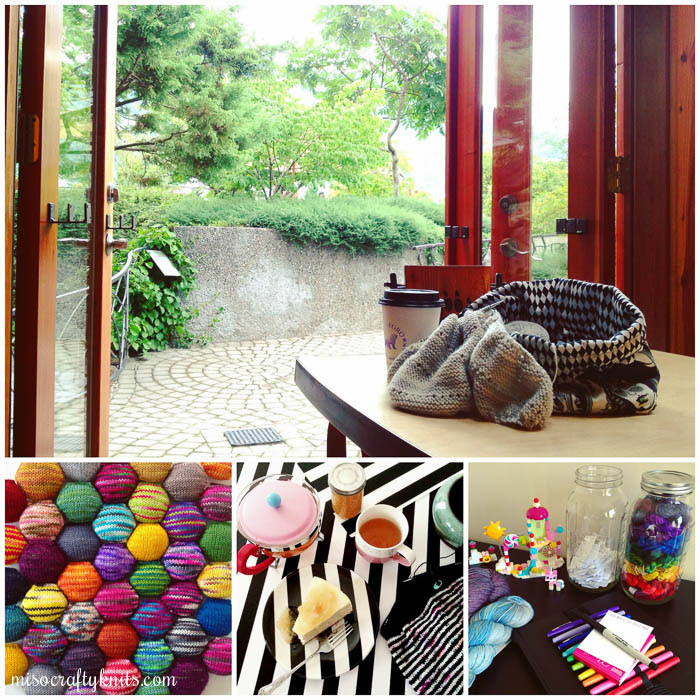 I've realized that I truly am all about the knitting and coffee. It's not a bad thing, but I really should get out more! Or at least try other forms of creating! @k_express - look out for an Instagram direct message from me! Thank you so much to all of the participants of this challenge!! We hope you had fun and that you'll join us again for the next one!! And thank you to the participants who gave me their permission to use their photos for this post!! this was so much fun!!! and I agree, the prompts were more introspective this time, it was so amazing seeing how everyone interpreted them. I had a blast joining in on the challenge. Thank you for "featuring" one of my photos. I hope you decide to make it a reoccurring challenge!